After a ridiculous weekend drive to Canada, this weekend is an opportunity to stay home and participate in Audubon's Great Backyard Bird Count. If you can participate, go to http://gbbc.birdcount.org/ and enter your sightings for any day between Friday and Monday. I've had some pretty cool birds to enter. 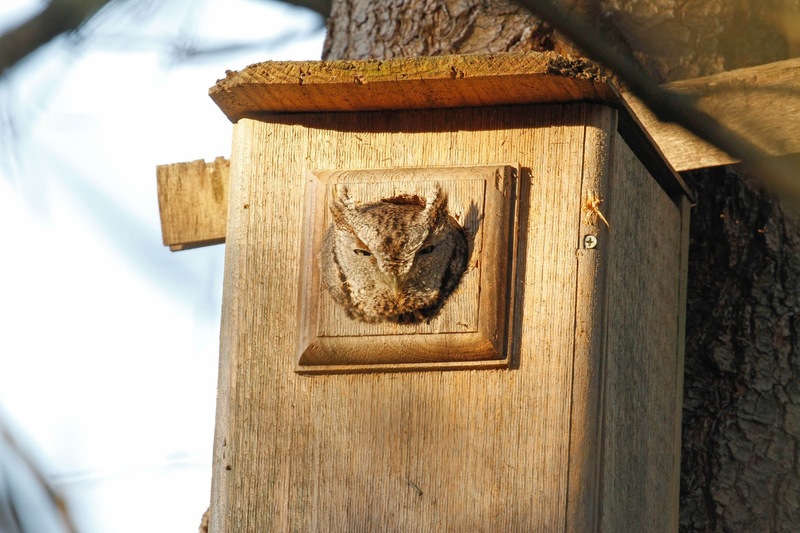 Of course, our little Screech Owl is being counted. Here he/she is the other day in bright daylight. He/she has been sitting up in the opening of the box almost every day for months now so safe to say that this is "home". Another raptor is making the count this year. 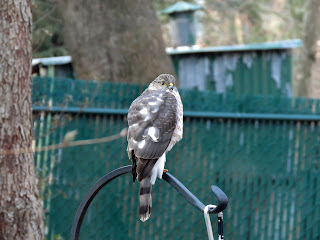 A young Cooper's hawk has been wreaking havoc on the yard birds for the past few days. 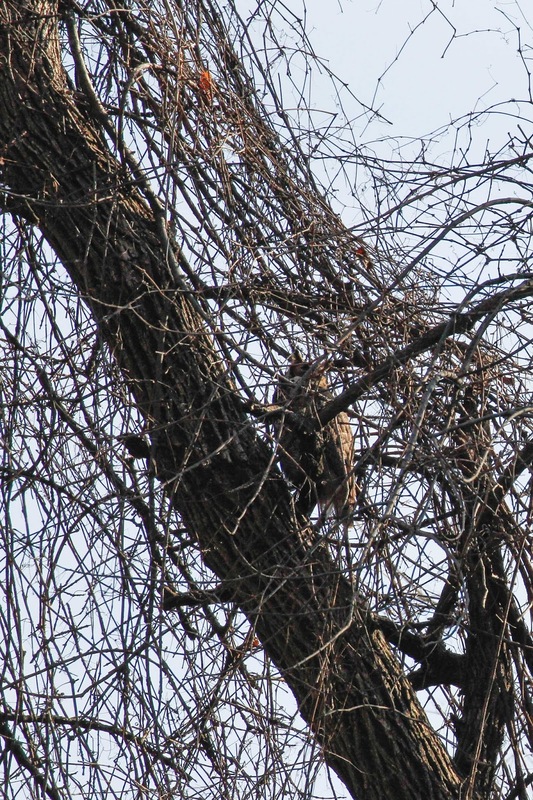 On Thursday, it crashed into the honeysuckle vine just outside of my office window chasing some sparrows. He came up short and sat on the bird feeder pole sulking. I call this one a "he" due to the small size of the bird. At first, I thought it might be a Sharp-shinned Hawk which are a smaller version of accipiter. In both cases, I root for the raptor even though I know that they eat the other birds. 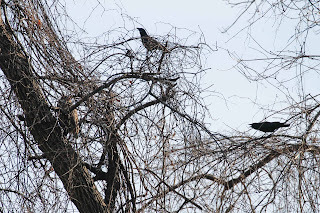 Anyway, I might end up counting fewer sparrows at the end of the weekend than at the beginning - if you know what I mean. Speaking of owls . 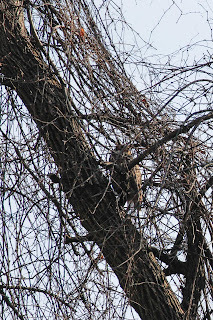 . . Connie and I took Peanut to Pennypack park this morning and found a Great Horned Owl perched in a tangle of vines. Before you wonder how in the world we could spot an owl in that mess, I'll tell you the truth. Connie and I didn't find this owl at all - the crows found him. 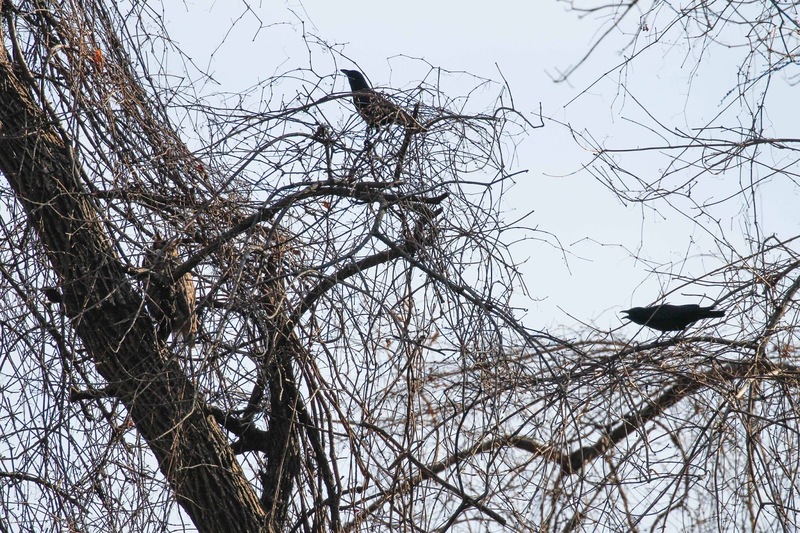 A good trick to finding owls and hawks in the woods is to listen for crows, Blue Jays or other birds going crazy. Chances are that they found a raptor that they want to harass into leaving their woods. Not bad for staying home huh? And much cheaper too.